This popular group started 2 or 3 years ago, we meet once a month in the Old Town Hall on the 2nd Friday morning, the quiz is run by different members each time. I must emphasise though that no-one is made to produce a quiz, and that it is purely voluntary. There is a small cost involved to cover the hall rental, and also the tea/coffee and biscuits. 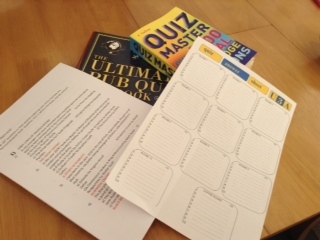 The quiz varies in type, sometimes there is a theme, and is usually 10 sections of 10 questions of varying categories, with a fun coffee break quiz to do as well. We sit in teams of up to 4 but if it carries on in popularity then these teams may get larger! It is all in fun, there are no prizes, and no record of wins etc. So simply a good fun way to spend a morning! Give it a try.